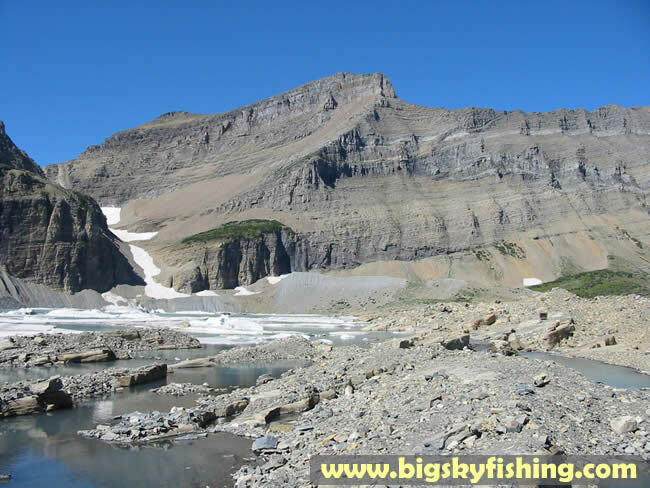 This photograph was taken on the "shores" of Upper Grinnell Lake, which is the terminus of the Grinnell Glacier Trail. The area around the Grinnell Glacier has all sorts of strange rock formations. This is due to the actions of the Glacier itself. Not too long ago, much of the exposed area that is around Grinnell Glacier today was under ice. The melting, or retreat, of the Grinnell Glacier has exposed this rock. As such, it makes for an interesting sight to see how the movement of the Grinnell Glacier in the past effected the rocks.